User Experience is a constantly evolving discipline. New technologies naturally change customer journeys and as practitioner’s our task is understanding those changes and adapting the UX to respond to the habits, behaviours and expectations of the customer. In the digital age that process has been dominated by psychology (particularly the psychology of human-computer interactions or HCI) and anthropology (usually through research based, ethnographic studies of user behavior). But as the industry adapts to the era of chatbots and digital assistants like Siri and Alexa there’s a new tool in the UX toolbox… linguistics. Linguistics will become hugely important in mainstream UX practice, but right now, conversation design is a relative newcomer compared to more familiar UX skills. The core interactive chat and voice technologies have been developing since the late ‘60s, but they have often appeared slightly niche (like in VR) or rudimentary (like Twitter bots and so on). But conversational tools are evolving very quickly and getting a lot smarter (with AI platforms to process language) and that leading edge quality of the underlying tech that means there’s less best practice to fall back on than other, more established technologies. That’s why chat, in all its forms, is one of the most exciting things to happen in the world of UX since the web came along. A new adventure for UX designers? Bringing linguistics into mainstream UX is exciting because in the conversational UX world we’re still asking the question “what makes a good conversation?” and the answer to that (as everyone knows) is “well, that all depends on the type of conversation you’re having.” So for many UX teams, as far hands-on conversational UX best practice goes, it’s the Wild West. The challenge is conversations begin as one thing, but they often change focus as they progress and end as a completely different kind of conversation. Like those typical household grumbles when you start having a perfectly friendly conversation about the weekly food shopping and end up moaning about who finished off the cornflakes and put the empty box back in the cupboard (we’ve all had those, right?) Conversations are tricky things, at times. Other aspects of UX are less nuanced and more easily characterized by best practice norms. For example, you can pretty much guarantee a green button means ‘yes’ and a red button means ‘no’ in any interface, or a mobile app optimized for landscape layout won’t fit well into a user journey where the device gets used in the street (usually in one hand with a thumb doing the clicking), but when it comes to conversations those norms don’t exist… yet. That means you have to ditch your assumptions about how conversation works, and get deeper into the linguistic nuances of the way we chat. Bringing linguistics into mainstream UX is exciting because in the conversational UX world we’re still asking the question “what makes a good conversation?” and the answer to that (as everyone knows) is “well, that all depends on the type of conversation you’re having.” So for many UX teams, as far as hands-on conversational UX best practice goes, it’s the Wild West. Ditching your conversational UX assumptions? You can’t assume there are easily computable chat norms. Consider the difference between your best friend asking “How are you today?” and a waiter asking you the same question. Same question, different answers depending on who’s asking. Our chats depend on context, and context represents a major challenge for conversation designers. Our studies show people give different answers to the same question depending on whether they’re responding over the phone, chat, email, SMS or in person. In person, the formality (or informality) of the setting and the natural rapport (or lack of it) between two people can change the conversation considerably. The same applies to text conversations. Linguistic devices like phrasing or emojis can significantly affect the way people react to what is being said. Everyone uses a different vocabulary and presents information in a different order depending on the channel they’re chatting through, based on their intuitive grasp of how the other person in the chat will most likely respond. Engineering that level of linguistic complexity into a chat engine takes a lot of careful study and experimentation. You also can’t assume your UX team has already got the right skills to design conversations. Conversations require a different writing skillset from apps, customer support pages, adverts, marketing or other forms of copy. You also can’t assume your UX team has already got the right skills to design conversations. Conversations require a different writing skillset from apps, customer support pages, adverts, marketing or other forms of copy. Conversational UX is currently dominated by short, clear statements and phrases that guide the user towards a conclusion, and making the chat responsive so you can anticipate where the phrase ‘Is there anything else I can do for you?’ might send an irritated customer with a lost delivery into a temper, or stimulate a happy customer to look for additional items and create an upsell opportunity. It’s a never-ending quest to design empathy into the system. That need for context and empathy also means recognizing that sometimes the customer experience would be better served by a real person-to-person conversation. As a conversation designer, you need to know when to be upbeat, when to be serious and when to bail out before things go south, just like in real-life conversations. How do you design a good conversation? You have to start by asking what the conversation is for. That sounds obvious, but it takes a well researched grasp of what the user is trying to achieve through a chat interface to design effectively for the context. So get your ethnographic filmmaker hat on (possibly a beret) and work out what’s motivating the need to chat, and also if chat is really the best tool for that specific job. Building the chat engine is the next step in the process, but what’s critically important is defining the KPIs that measure ‘chat success’. Generally speaking, the goal of conversational UX is to raise customer satisfaction scores, so you need to measure metrics like the time a chat takes and whether the user completes the task in-chat or clicks the ‘speak to a person’ button. You also need to monitor how the chat engine understands the user’s answers so you can identify when certain syntax or contractions cause errors or bugs in its ability to respond. One popular approach for managing the efficacy of a chat UX is offering the user pre-formatted replies, such as buttons or voice prompts to reply ‘yes’ ‘no’ ‘show more’ and so on (depending on the scenario). Users often report they like the immediacy of a chat interaction and the low effort of talking to a bot, which makes sense because chatting with real humans requires more effort than giving blunt one-word answers, so that approach makes sense for many kinds of chat. But that depends on your branding. The brevity of a serious banking chat might not work for a salesy youthful fashion brand, it’s a matter of judgement and testing. Generally speaking, the goal of conversational UX is to raise customer satisfaction scores, so you need to measure metrics like the time a chat takes and whether the user completes the task in-chat or clicks the ‘speak to a person’ button. You also need to monitor how the chat engine understands the user’s answers so you can identify when certain syntax or contractions cause errors or bugs in its ability to respond. It’s also useful to remember chat interactions facilitate much easier data capture for personally identifiable information (e.g. “can I get your email address?” or “Can I ask how old you are?”) and incorporating data capture into the chat can make it more effective. The more a system can access the customer’s profile data, the more it can adapt the conversation around them and avoid sounding too jokey with an unhappy customer, or sounding too serious with new prospect, using emojis with an elderly person or using formal language with a teen (and so on). That implies a back end that can work with multiple data sets in real time and curate appropriate, context-specific responses, so AI will probably feature behind the scenes. Conversations are all about context, and a baked-in testing process plus real-time customer profile data access helps get the context-tone balance right. 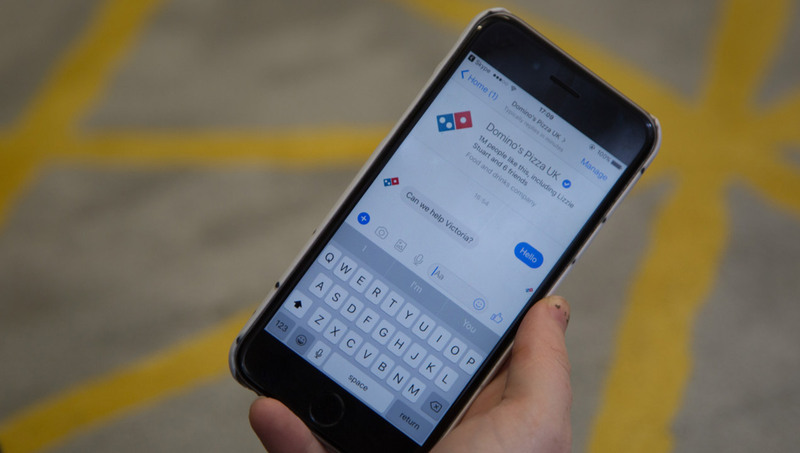 The future of conversational UX? At such an early stage in its development, making predictions feels a bit premature. But we do have some big clues as where conversational UX is heading. 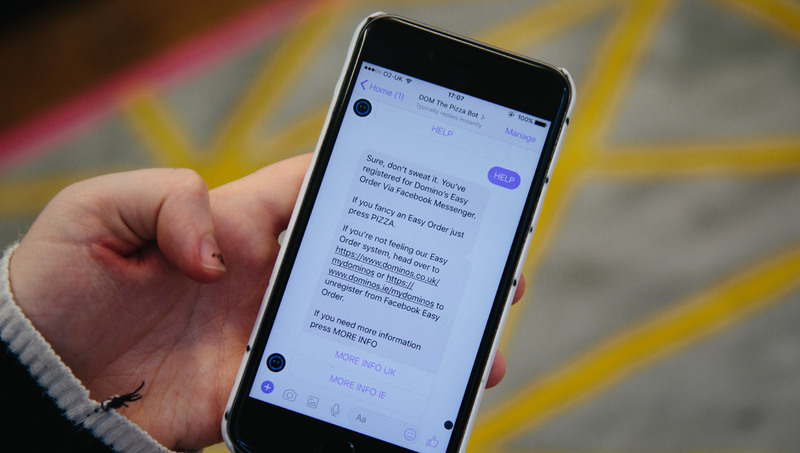 We know that chat is highly effective for building self-service, automated tools, which are predicted to become increasingly important (and commonplace) in customer experience a few years down the line. Even now, studies show around 44% of US consumers say they prefer chatbots over humans for typical CRM functions. 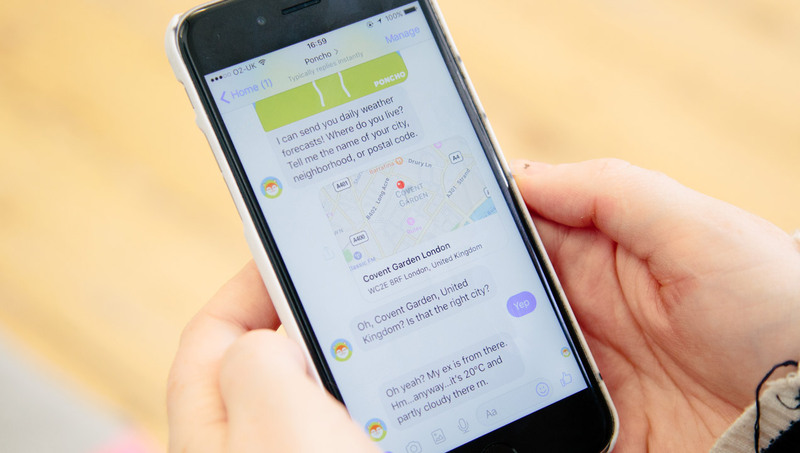 The design and experiential quality of automated tools is also tipped to become a major differentiator between brands, perhaps even more so than price or product, so we can predict a boom in conversational UX in certain consumer categories with a degree of hype-sceptical confidence. But beyond that? What we can say for certain is the future (and the limits) of conversation in UX will be defined by a process we call ‘diligent augmentation’. Analytics and UX research is significantly more established best practice than it was when websites or apps first appeared, and that means we’re better equipped to study how each conversation works, and through agile development processes, keep up the incremental upgrade and release schedules needed to take conversation tech further. That’s where it gets tricky. One thing any UX researcher knows is that the way people use technology evolves and so does their behaviour, depending on where they see the tech fit into their lives. Back in the ‘90s who would have guessed we’d one day measure the desirability of a telephone product based on its camera hardware or its abilities to post into social networks? Or that SMS, which was a telecoms engineer test platform, would spawn the world of messaging apps we take for granted today? Or that brick-and-mortar retail giants would be chasing lost sales to digital players like Amazon? Put conversational UX into that big picture and the sky’s the limit. What we can say for certain is the future (and the limits) of conversation in UX will be defined by a process we call ‘diligent augmentation’. Analytics and UX research is significantly more established best practice than it was when websites or apps first appeared, and that means we’re better equipped to study how each conversation works, and through agile development processes, keep up the incremental upgrade and release schedules needed to take conversation tech further. It might mean adjusting the traditional UX mindset a bit, and creating smarter processes for brands to manage customer experience programs to keep up, but new thinking and keeping up with the lightning fast pace of popular technology is something the UX industry is used to. In the end the conversational UX opportunity means – like when they invented the printing press and through all major new technological leaps since – ditching some established conventions, recruiting new skills and designing smarter processes for a changing customer ecosystem. Fortunately, that kind of business conversation is relatively easy because it’s between humans, and humans are naturally skilled at conversations in a way bots aren’t. Well, not yet, anyway. Special thanks to Philip Say and Lauren Nham for their great insights on AI & chatbot technology.